Our annual month-long celebration of true hoppiness returns for its 4th year. This year we’ll be pouring: Icky IPA, Black Eye P.A., Red Eye P.A., White Eye P.A., Tectonic Event Imperial IPA, and our newest – Hop Rift IPA. Enjoy flights of all 6 IPAs for just $9. 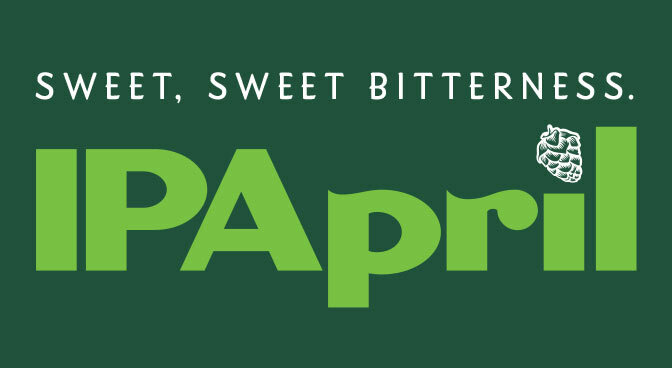 With every flight you order, you’ll receive one entry into our IPApril drawing for kegs, swag, and more! Raffle winners will be announced May 1. In 2016, a team of paleontologists from Bonn University in Germany traveled to the mountains of central Nevada in hopes of unearthing ancient Ichthyosaur fossils for the Natural History Museum of Los Angeles. What they discovered when they began digging were 12 unique species of Ichthyosaurs – one of them being, most likely, the oldest known large predator ever discovered (roughly 243 million years old). We joined the expedition knowing this would be an important discovery in understanding the evolution of Nevada’s State fossil. 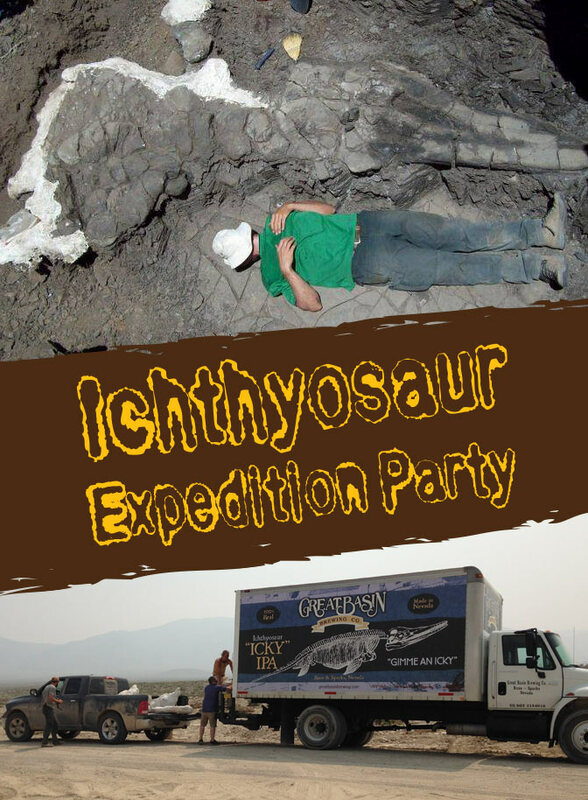 From our donations to help fund the expedition to physically driving the prehistoric fossils to Los Angeles (in our ICKY Beer Truck of course! ), we were humbled to play a part in this genuinely historic dig. Join us as Dr. Martin Sander of Bonn University in Germany returns to Nevada at our Taps & Tanks brewery on April 7th where he will present the expeditions’s latest discoveries. This will be a family friendly event so bring the kids down to discover these never before seen dinosaurs! • Our first release in the Ichythosaur Expedition Beer Series: The Phalarodon. It’s a mighty barrel-aged dry-hopped IPA that will take you to prehistoric times. Proceeds from the party will benefit next year's field research. This international expedition was funded and sponsored by The National Geographic Society, Bonn University (Germany), The German Research Foundation, The Natural History Museum of Los Angeles, Nevada Lands, and Great Basin Brewing Company. 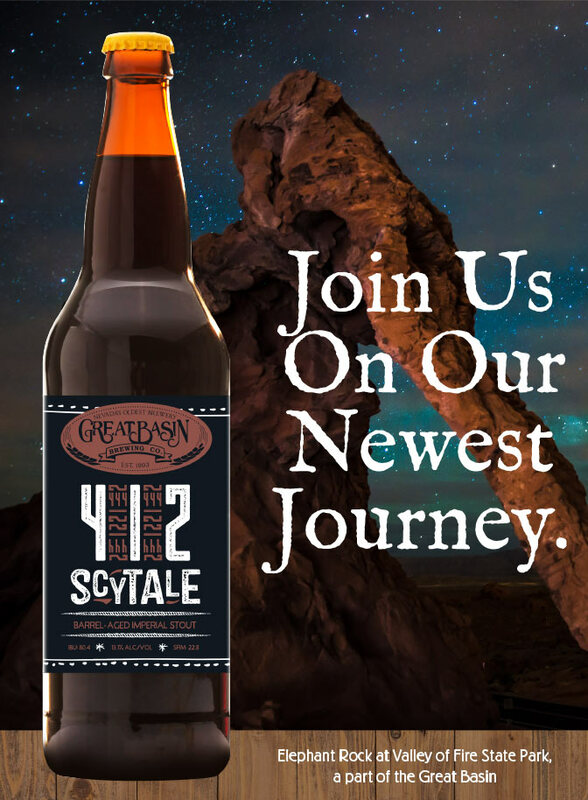 412 Scytale is an immensely rich and complex Barrel-Aged Imperial Stout that began its metamorphosis in early 2016 when our Brewmaster carefully filled charred oak bourbon barrels with the pitch black elixir. There it matured and transformed, waiting for just the right moment to emerge. That time is now. Look for 22 oz bottles of this singular release in our brewpubs and stores where Great Basin beer is sold while it lasts. As the record-breaking winter finally packs up and goes south for the summer (hopefully? ), we’re helping to warm things up with our annual release of Cerveza Chilebeso. 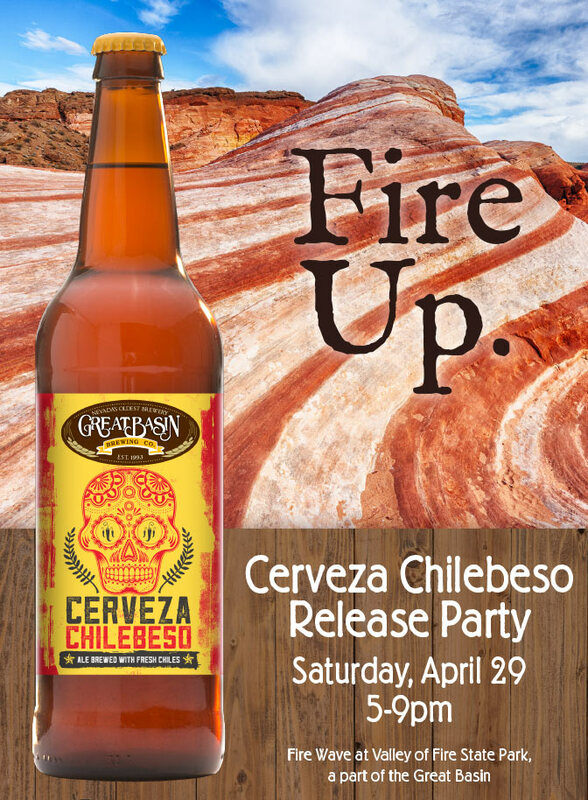 Join us Saturday, April 29th from 5-9pm at our Taps & Tanks brewery for our raucous Cerveza Chilebeso Release Party! We’ll have a local Mariachi, taco bar, pints & bombers of Cerveza Chilebeso to enjoy, Chilebeso shirts and pint glasses, and a silent raffle! We’re also donating $1 from every pint sale to benefit the Sparks Rotary Global Polio Eradication Initiative. Also, be on the lookout for a possible donkey sighting! 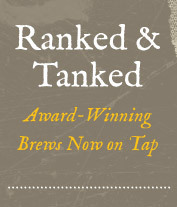 Congratulations to our March Free Beer for a Year winner, Mark Coscuna! Keep getting those entries in, we'll be picking a new winner May 1st!